Thanks to superior German engineering, the wiz-kids at VW have managed to squeeze more than two inches of additional rear legroom into a car that's a full four inches shorter than the 2018 Ford Focus ST. There will be no more fights over shotgun in the 2018 VW Golf GTI. The interior of the 2018 Volkswagen Golf GTI is adorned with plenty of premium features you won't find on a stock Focus ST, including a 400-watt, eight-speaker sound system by Fender — standard. You only get six speakers in the base 2018 Ford Focus ST. Finally, Volkswagen's Car-Net® infotainment system comes standard with a beautiful 6.5” touchscreen plus Apple CarPlay™ and Android Auto™ connectivity. The stock Ford infotainment system on the 2018 Focus ST falls well short of this connectivity and convenience. The 2018 Volkswagen Golf GTI is quicker and more nimble than even the venerable 2018 Ford Focus ST — even though the Focus ST has got a bigger engine. That's because the 2018 VW Golf GTI makes use of state-of-the-art performance systems like standard driving mode selection and available DCC® Adaptive Chassis Control, which adjusts damper settings on the fly for each individual wheel. Folks will be sure to notice all that extra speed, too — LED taillights, LED fog lights, interior ambient lighting and red brake calipers come standard. 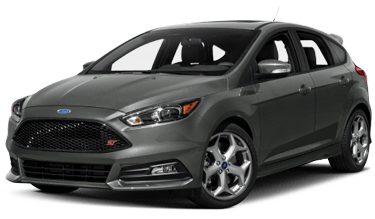 LED headlights with Adaptive Front-lighting System to follow your steering and help you see ahead in the corners are also available — which you can't get on the 2018 Ford Focus ST. While both vehicles received 5-star crash-test ratings from the National Highway Traffic Safety Administration, the 2018 Ford Focus ST got the short end of the stick when it comes to active safety features and autonomous driving aids. The 2018 Volkswagen Golf GTI comes standard with Automatic Post-Collision Braking and Intelligent Post-Crash Response System. In the event of a crash, the Golf GTI will shut off the fuel pump, engage the brakes and call for help automatically in case you're unable. The 2018 VW Golf GTI is also available with high-tech active safety features like Adaptive Cruise Control, Blind-Spot Monitor, Lane Assist and Front Assist with Pedestrian Monitoring — to help you avoid a collision altogether. None of these sophisticated safety systems are available on the 2018 Ford Focus ST.